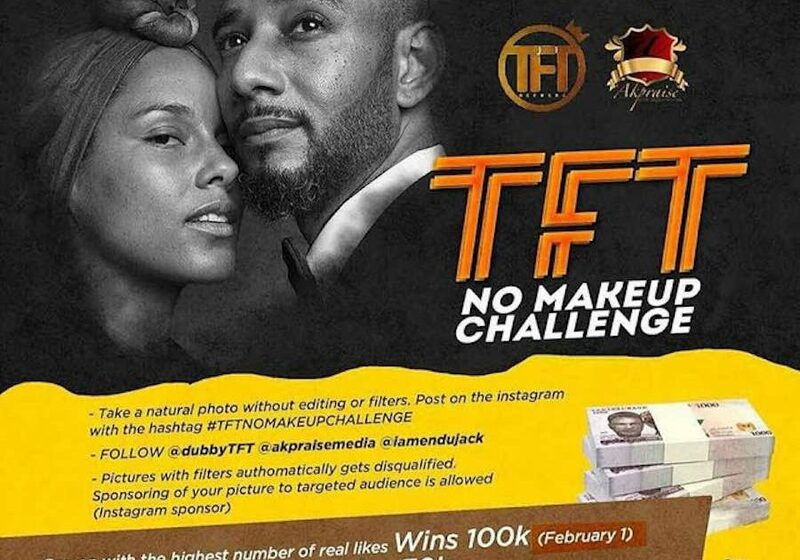 From the stables of TFT RECORDS, a Nigerian entertainment company is known for promoting grassroots talent in partnership with your award-winning online music hub AKPRAISE MEDIA presents you the #TFTnomakeupChallenge. The challenge is as simple as possible if only you follow the under listed steps chronologically. 1. Take a natural selfie without editing or applying filters. 3. Post your selfie on Instagram with the hashtag #TFTnomakeupChallenge cc @DubbyTFT @akpraisemedia @iamendujack. 4. Pictures with any form of filters or effects automatically get disqualified. 5. Sponsoring of your photos for real likes is allowed (Instagram sponsor). 6. Buying of fake likes is not allowed (Automatic disqualification). 7. The contest is open to both males and females. 8. The person with the highest number of real Instagram like wins 100k (One Hundred Thousand Naira). Contest Ends on 1sT February 2018.